It has been said there are 10 times as many bacterial cells as human cells in the average human body.1 That’s what has been said, but it’s probably not true.2 Still, there is undoubtedly a large and complex ecology of micro-organisms living in and on every individual mammal, and this ecology has multi-faceted and important health effects.3 Micro-organisms produce important nutrients, influence immune function and digestion, and have other beneficial effects on health.3 Disruption of this ecosystem can have negative health effects, as anyone who has suffered from antibiotic-associated diarrhea can attest! Our growing understanding of the importance of commensal micro-organisms has led to the hope we may be able to deliberately alter the microbial flora of healthy animals and veterinary patients to achieve targeted, beneficial health effects. Micro-organisms (e.g. bacteria or yeast) that are administered to prevent or treat disease are known as probiotics. A lucrative industry has emerged to produce and sell such organisms. However, despite well-established basic science showing the importance of the microbial flora to health, it is not a simple matter to produce safe and effective probiotic therapies. Any effective probiotic must be able to survive ingestion and establish itself in the body, and then influence an enormous, complex, and poorly understood microbial ecology in a positive way. One skeptic has likened giving probiotics to planting a putting green in the Amazon rainforest. Inserting a small quantity of a non-native organism into such an ecosystem may very well have little impact. The devil is in the details, and much remains to be learned about probiotic organisms, formulation and dosing, species and individual differences, and other critical factors involved in clinical use of probiotic treatments. The problem of poor quality control in unregulated supplements also pertains to probiotics. Studies have shown the majority of veterinary probiotics sampled are mislabelled or do not contain the type and amount of micro-organism they are supposed to have.4-5 Even if particular organisms are useful for specific indications, it cannot be assumed other probiotic products will be effective in the same circumstances or that effects seen in clinical studies will translate across species or indications. • Strong preclinical evidence—from in vitro and lab animal studies—suggests probiotics could have significant beneficial effects. • There is moderate to strong evidence in humans for some probiotics for certain indications, such as antibiotic-associated diarrhea and irritable bowel syndrome (IBS). For most indications, however, the evidence is encouraging, but still weak. • In veterinary patients, the best case can be made for use of probiotics in acute diarrhea, though even for this indication, the evidence is neither strong nor consistent. The evidence for most other indications is insufficient to draw reliable conclusions. • Despite a lack of research specifically assessing safety, probiotics generally are considered safe in immunocompetent individuals. • Many veterinary probiotic products are inaccurately labelled, and there is poor quality control in the probiotic market. Probiotics have been recommended for a variety of clinical problems in veterinary species, including spontaneous and antibiotic-associated diarrhea, inflammatory bowel disease, viral upper respiratory infection, and renal failure. A handful of studies have been done looking at these and other uses, mostly in regard to indications for which there is some positive evidence in humans.6,7 The following are some common indications for which probiotics have been recommended, along with brief summaries of the available evidence. These studies also vary in the probiotic used, patient population, and methods. Overall, the existing evidence for the value of probiotics in preventing and treating acute diarrhea is encouraging, though still not robust. 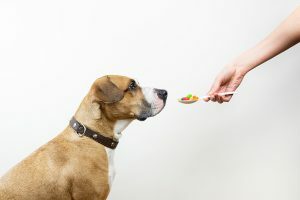 Other studies show effects of probiotics on the gastrointestinal (GI) flora and the host in dogs with food-responsive enteropathy, idiopathic inflammatory bowel disease, and other chronic enteropathies.6 However, no definitive studies show improvement in long-term symptom control or other clinically important outcomes on dogs or cats with chronic GI disease. As probiotics have various effects on the immune system, several studies have looked at the potential value of probiotic treatment in management of allergic dermatopathy.6,13,14 Once again, there are some encouraging results, but predictable, durable, clinically meaningful improvement in real-world use has not yet been shown. A single pilot study has been reported evaluating probiotic use in cats with feline herpesvirus infection.15 The study was small; results were mixed and did not show a convincing beneficial effect. As with atopic dermatitis, additional research is warranted, but there isn’t much basis for clinical use at this point. Some preliminary studies in rats and pigs have suggested probiotics might reduce azotemia or otherwise benefit patients with chronic kidney disease (CKD).16 Uncontrolled observations in cats and dogs also have suggested similar effects, though the risk of bias in such studies is very high.16 At least one commercial probiotica has been marketed for this purpose and has been the subject of several studies.16-18 Though small and with typical limitations, these controlled studies have not found any convincing evidence of a meaningful impact of this probiotic on renal disease in dogs or cats. Some evidence of direct patient harm has been reported in veterinary species.11 There also are concerns about indirect risks, such as the transmission of antibiotic resistance genes from probiotic species to pathogenic organism. This led to the refusal of one regulatory agency, the European Food Safety Authority (EFSA), to approve the use of a commercial veterinary probiotic when the constituent organism was found to be resistant to clindamycin.21 Despite such concerns and the uncertainty of limited evidence, probiotics have been widely available and frequently used in research and clinical settings without many reports of obvious harm to veterinary patients. Sender R, Fuchs S, Milo R. Are We Really Vastly Outnumbered? Revisiting the Ratio of Bacterial to Host Cells in Humans. Cell. 2016;164:337–40. Sender R, Fuchs S, Milo R. Revised Estimates for the Number of Human and Bacteria Cells in the Body. PLoS Biol. 2016;14(8):e1002533. Zhang Y-J, Li S, Gan R-Y, et al. Impacts of Gut Bacteria on Human Health and Diseases. Sugumaran M, ed. Int J Mol Sci. 2015;16(4):7493-7519. Weese JS. Microbiologic evaluation of commercial probiotics. JAVMA. 2002;220(6): 794-7. Weese JS, Martin H. Assessment of commercial probiotic bacterial contents and label accuracy. Canadian Vet J. 2011;52:43–6. Wynn SG. Probiotics in veterinary practice. JAVMA. 2009;234(5):606-13. Herstad HK, Nesheim BB, L’Abée-Lund T, et al. Effects of a probiotic intervention in acute canine gastroenteritis–a controlled clinical trial. J Small Anim Pract. 2010;51(1):34-8. Bybee SN, Scorza AV, Lappin MR. Effect of the Probiotic Enterococcus faecium SF68 on Presence of Diarrhea in Cats and Dogs Housed in an Animal Shelter. J Vet Int Med. 2011;25(4):856-60. Weese JS, Rousseau J, Evaluation of Lacotbacilluc pentosus WE7 for prevention of diarrhea in neonatal foals. JAVMA. 2005;226(12):2031-34. Schoster A, Weese JS, Guardabassi L. Probiotic Use in Horses – What is the Evidence for Their Clinical Efficacy? J Vet Intern Med. 2014;28:1640–52. Ohshima-Terada Y, Higuchi Y, Kumagai T, et al. Complementary effect of oral administration of Lactobacillus paracasei K71 on canine atopic dermatitis. Vet Dermatol. 2015;26(5):350-3. Lappin MR, Veir JK, Satyaraj E, et al. Pilot study to evaluate the effect of oral supplementation of Enterococcus faecium SF68 on cats with latent feline herpesvirus 1. J Fel Med Surg. 2009;11(8):650-4. Polzin DJ. Probiotic Therapy of Chronic Kidney Disease. ACVIM Forum 2011. Denver, CO.
Kanakubo S, Ross H, Finke J. Influence of AzodylTM on Urea and Water Metabolism in Uremic Dogs. ACVIM Forum 2013 Seattle, WA. Rishniw M, Wynn S. Azodyl fails to reduce azotemia in cats with chronic kidney Disease (CKD) when sprinkled onto food. J Feline Med Surg. 2011;Jun;13(6):405-9. Didari T, Solki S, Mozaffari S, et al. A systematic review of the safety of probiotics. Expert Opin Drug Saf. 2014;13(2):227-39. Hempel S, Newberry S, Ruelaz A, et al. Safety of probiotics used to reduce risk and prevent or treat disease. Evid Rep Technol Assess (Full Rep). 2011;(200):1-645. EFSA Panel on Additives and Products or Substances used in Animal Feed (FEEDAP); Scientific Opinion on the safety and efficacy of Prostora Max (Bifidobacterium animalis) as a feed additive for dogs. EFSA Journal. 2012;10(12):2964. Brennen McKenzie, MA, M.Sc., VMD, cVMA, discovered evidence-based veterinary medicine after attending the University of Pennsylvania School of Veterinary Medicine and working as a small animal general practice veterinarian. He has served as president of the Evidence-Based Veterinary Medicine Association and reaches out to the public through his SkeptVet blog, the Science-Based Medicine blog, and more. He is certified in medical acupuncture for veterinarians. Columnists’ opinions do not necessarily reflect those of Veterinary Practice News Canada.